Seven Pine Island community in Jacksonville, Florida. 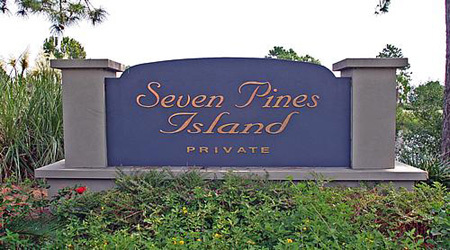 Seven Pine Island is a private, gated residential community located along the Intracoastal Waterway. Seven Pine Island has become a popular hideaway for avid fishermen and water-sport enthusiasts alike. The community features a clubhouse, tennis court, boat slips and nature trails. The calm aura, adventurous excursions and easy-going atmosphere have made this 50-homes community one of Jacksonville's most desirable waterfront living destinations. Enjoy life on the Intracoastal. From magnificent waterfront views to spectacular boats and yachts, the Intracoastal is the perfect place to enjoy a laid-back, luxurious lifestyle.